Surrealism grew out of the Dada movement, which was also in rebellion against middle-class complacency. Artistic influences, however, came from many different sources. 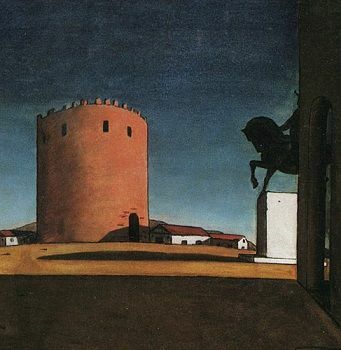 The most immediate influence for several of the Surrealists was Giorgio de Chirico, their contemporary who, like them, used bizarre imagery with unsettling juxtapositions. They were also drawn to artists from the recent past who were interested in primitivism, the naive, or fantastical imagery, such as Gustave Moreau, Arnold Bocklin, Odilon Redon, and Henri Rousseau. Even artists from as far back as the Renaissance, such as Giuseppe Arcimboldo and Hieronymous Bosch, provided inspiration in so far as these artists were not overly concerned with aesthetic issues involving line and color, but instead felt compelled to create what Surrealists thought of as the "real." The Surrealist movement began as a literary group strongly allied to Dada, emerging in the wake of the collapse of Dada in Paris, when André Breton's eagerness to bring purpose to Dada clashed with Tristan Tzara's anti-authoritarianism. Breton, who is occasionally described as the 'Pope' of Surrealism, officially founded the movement in 1924 when he wrote "The Surrealist Manifesto." However, the term "surrealism," was first coined in 1917 by Guillaume Apollinaire when he used it in program notes for the ballet Parade, written by Pablo Picasso, Leonide Massine, Jean Cocteau, and Erik Satie. Around the same time that Breton published his inaugural manifesto, the group began publishing the journal La Révolution surréaliste, which was largely focused on writing, but also included art reproductions by artists such as de Chirico, Ernst, André Masson, and Man Ray. Publication continued until 1929. The Bureau for Surrealist Research or Centrale Surréaliste was also established in Paris in 1924. This was a loosely affiliated group of writers and artists who met and conducted interviews to "gather all the information possible related to forms that might express the unconscious activity of the mind." Headed by Breton, the Bureau created a dual archive: one that collected dream imagery and one that collected material related to social life. At least two people manned the office each day - one to greet visitors and the other to write down the observations and comments of the visitors that then became part of the archive. In January of 1925, the Bureau officially published its revolutionary intent that was signed by 27 people, including Breton, Ernst, and Masson. Surrealism shared much of the anti-rationalism of Dada, the movement out of which it grew. The original Parisian Surrealists used art as a reprieve from violent political situations and to address the unease they felt about the world's uncertainties. By employing fantasy and dream imagery, artists generated creative works in a variety of media that exposed their inner minds in eccentric, symbolic ways, uncovering anxieties and treating them analytically through visual means. There were two styles or methods that distinguished Surrealist painting. Artists such as Salvador Dalí, Yves Tanguy, and René Magritte painted in a hyper-realistic style in which objects were depicted in crisp detail and with the illusion of three-dimensionality, emphasizing their dream-like quality. The color in these works was often either saturated (Dalí) or monochromatic (Tanguy), both choices conveying a dream state. Several Surrealists also relied heavily on automatism or automatic writing as a way to tap into the unconscious mind. Artists such as Joan Miró and Max Ernst used various techniques to create unlikely and often outlandish imagery including collage, doodling, frottage, decalcomania, and grattage. Artists such as Hans Arp also created collages as stand-alone works. Hyperrealism and automatism were not mutually exclusive. Miro, for example, often used both methods in one work. In either case, however the subject matter was arrived at or depicted, it was always bizarre - meant to disturb and baffle. Breton felt that the object had been in a state of crisis since the early-19th century and thought this impasse could be overcome if the object in all its strangeness could be seen as if for the first time. The strategy was not to make Surreal objects for the sake of shocking the middle class a la Dada but to make objects "surreal" by what he called dépayesment or estrangement. The goal was the displacement of the object, removing it from its expected context, "defamilarizing" it. Once the object was removed from its normal circumstances, it could be seen without the mask of its cultural context. These incongruous combinations of objects were also thought to reveal the fraught sexual and psychological forces hidden beneath the surface of reality. A limited number of Surrealists are known for their three-dimensional work. Arp, who began as part of the Dada movement, was known for his biomorphic objects. Oppenheim's pieces were bizarre combinations that removed familiar objects from their everyday context, while Giacometti's were more traditional sculptural forms, many of which were human-insect hybrid figures. Dalí, less known for his 3D work, did produce some interesting installations, particularly, Rainy Taxi (1938), which was an automobile with mannequins and a series of pipes that created "rain" in the car's interior. Photography, because of the ease with which it allowed artists to produce uncanny imagery, occupied a central role in Surrealism. Artists such as Man Ray and Maurice Tabard used the medium to explore automatic writing, using techniques such as double exposure, combination printing, montage, and solarization, the latter of which eschewed the camera altogether. Other photographers used rotation or distortion to render bizarre images. The Surrealists also appreciated the prosaic photograph removed from its mundane context and seen through the lens of Surrealist sensibility. Vernacular snapshots, police photographs, movie stills, and documentary photographs all were published in Surrealist journals like La Révolution surréaliste and Minotaure, totally disconnected from their original purposes. 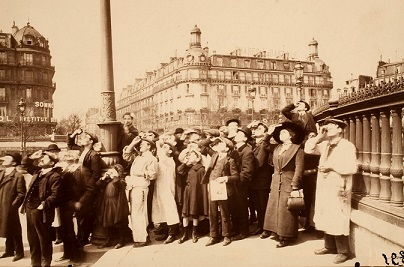 The Surrealists, for example, were enthusiastic about Eugène Atget's photographs of Paris. Published in 1926 in La Révolution surréaliste at the prompting of his neighbor, Man Ray, Atget's imagery of a quickly vanishing Paris was understood as impulsive visions. Atget's photographs of empty streets and shop windows recalled the Surrealist's own vision of Paris as a "dream capital." Surrealism was the first artistic movement to experiment with cinema in part because it offered more opportunity than theatre to create the bizarre or the unreal. The first film characterized as Surrealist was the 1924 Entr'acte, a 22-minute, silent film, written by Rene Clair and Francis Picabia, and directed by Clair. But, the most famous Surrealist filmmaker was of course Luis Buñuel. Working with Dalí, Buñuel made the classic films Un Chien Andalou (1929) and L'Age d'Or (1930), both of which were characterized by narrative disjunction and their peculiar, sometimes disturbing imagery. In the 1930s Joseph Cornell produced surrealist films in the United States, such as Rose Hobart (1936). Salvador Dalí designed a dream sequence for Alfred Hitchcock's Spellbound (1945). Though Surrealism originated in France, strains of it can be identified in art throughout the world. Particularly in the 1930s and 1940s, many artists were swept into its orbit as increasing political upheaval and a second global war encouraged fears that human civilization was in a state of crisis and collapse. The emigration of many Surrealists to the Americas during WWII spread their ideas further. 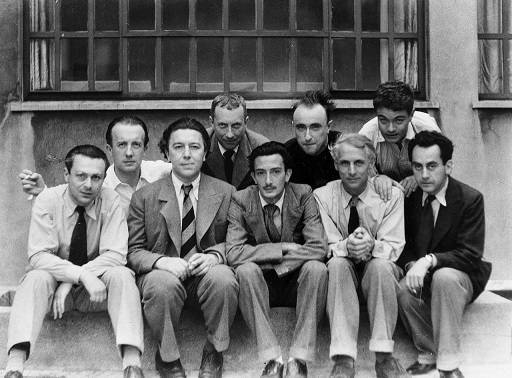 Following the war, however, the group's ideas were challenged by the rise of Existentialism, which, while also celebrating individualism, was more rationally based than Surrealism. In the arts, the Abstract Expressionists incorporated Surrealist ideas and usurped their dominance by pioneering new techniques for representing the unconscious. Breton became increasingly interested in revolutionary political activism as the movement's primary goal. The result was the dispersal of the original movement into smaller factions of artists. The Bretonians, such as Roberto Matta, believed that art was inherently political. Others, like Yves Tanguy, Max Ernst, and Dorothea Tanning, remained in America to separate from Breton. Salvador Dalí, likewise, retreated to Spain, believing in the centrality of the individual in art. In 1936, the Museum of Modern Art in New York staged an exhibition entitled Fantastic Art, Dada, Surrealism, and many American artists were powerfully impressed by it. Some, such as Jackson Pollock, began to experiment with automatism, and with imagery that seemed to derive from the unconscious - experiments which would later lead to his "drip" paintings. Robert Motherwell, similarly, is said to have been "stuck between the two worlds" of abstraction and automatism. Largely because of political upheaval in Europe, New York rather than Paris became the emergent center of a new vanguard, one that favored tapping the unconscious through abstraction as opposed to the "hand-painted dreams" of Salvador Dalí. Peggy Guggenheim's 1942 exhibition of Surrealist-influenced artists (Rothko, Gottlieb, Motherwell, Baziotes, Hoffman, Still, and Pollock) alongside European artists Miró, Klee, and Masson, underscores the speed with which Surrealist concepts spread through the New York art community. The Surrealists have often been depicted as a tightly knit group of men, and their art often envisioned women as wild "others" to the cultured, rational world. Work by feminist art historians has since corrected this impression, not only highlighting the number of women Surrealists who were active in the group, particularly in the 1930s, but also analyzing the gender stereotypes at work in much Surrealist art. Feminist art critics, such as Dawn Ades, Mary Ann Caws, and Whitney Chadwick, have devoted several books and exhibitions to this subject. 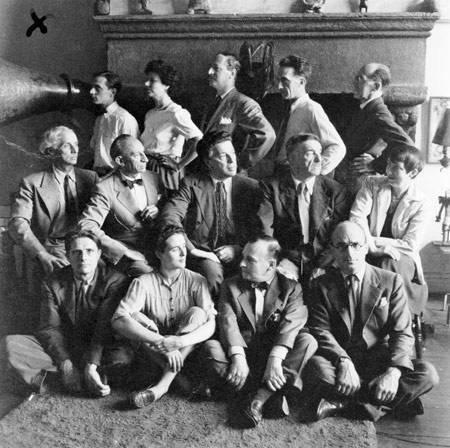 While most of the male Surrealists, especially Man Ray, Magritte, and Dalí, repeatedly focused on and/or distorted the female form and depicted women as muses, much in the way that male artists had for centuries, female Surrealists such as Claude Cahun, Lee Miller, Leonora Carrington, and Dorothea Tanning, sought to address the problematic adoption of Freudian psychoanalysis that often cast women as monstrous and lesser. Thus, many female Surrealists experimented with cross-dressing and depicted themselves as animals or mythic creatures. Interestingly, many notable female Surrealists were British. Examples include Eileen Agar, Ithell Colquhoun, Edith Rimmington, and Emmy Bridgewater. Particular to the British interpretation of Surrealist ideology was an ongoing exploration of human relations with their surrounding natural environment and most prominently, with the sea. 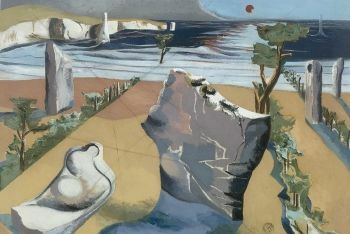 Alongside Agar, Paul Nash developed an interest in the object trouvé, usually in the form of items collected from the beach. The focus on the border where land meets the sea, and where rocks anthropomorphically resemble people struck a cord with British identity and more generally, with Surrealist principles of reconciling and uniting opposites. The International Surrealist Exhibition (1936) held in London was a particular catalyst for many British artists. Headed by Roland Penrose and Herbert Read, the movement thrived in Britain, creating the international icons Leonora Carrington and Lee Miller, and also spurring on the practice of another important circle of artists surrounding Ben Nicholson, Barbara Hepworth, and Henry Moore. Overall, the privileging of an eccentric imagination and essential rejection of standardized and rational modes of doing things resonated well from the outset. This golden period for art in general in the UK, and more specifically the legacies of British Surrealism continue to influence the country’s art practice today. "Beloved imagination, what I most like in you is your unsparing quality." "Knowing how to look is a way of inventing." "Art is the fatal net which catches these strange moments on the wing like mysterious butterflies, fleeing the innocence and distraction of common men." "Collage is the noble conquest of the irrational, the coupling of two realities, irreconcilable in appearance, upon a plane which apparently does not suit them." "Art evokes the mystery without which the world would not exist." "Nature does not create works of art. It is we, and the faculty of interpretation peculiar to the human mind, that see art." "If we had to obey the decrees laid down by the Surrealist group, there would be virtually no Surrealist photography or even any genuinely Surrealist films, but Surrealism is not a theorem"
"Surrealism is destructive, but it destroys only what it considers to be shackles limiting our vision." "Surrealism had a great effect on me because then I realized that the imagery in my mind wasn't insanity. Surrealism to me is reality." "[the contribution was in their determination] to tap the creative and imaginative forces of the mind at their source in the unconscious and, through the increase in self-knowledge achieved by confronting people by their real nature, to change society." "Contrary to prevalent misdefinitions, surrealism is not an aesthetic doctrine, nor a philosophical system, nor a mere literary or artistic school. It is an unrelenting revolt against a civilization that reduces all human aspirations to market values, religious impostures, universal boredom and misery." "Putting psychic life in the service of revolutionary politics, Surrealism publicly challenged vanguard modernism's insistence on 'art for art's sake.' But Surrealism also battled the social institutions - church, state, and family - that regulate the place of women within patriarchy. In offering some women their first locus for artistic and social resistance, it became the first modernist movement in which a group of women could explore female subjectivity and give form (however tentatively) to a feminine imaginary."